Leather blazers are really inn this season. When you shop for leather items, make sure you learn about the different types of leather that are available, price etc. 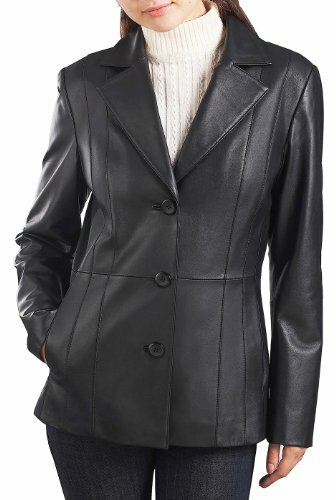 Hi-fashion leather blazers are available in 2 button & 3-button styles. Different colors of leather used to make stylish blazers are black, brown, olive green, yellow, red, warm toned caramel, cognac, sienna and chocolate brown. Approx. body length from center back: regular 26.5"; plus 28.5"; regular short 25.5"; plus short 27.5"
Chamois: Leather originally made from the Alpine chamois, a goat-like animal. Nowadays, it’s culled from sheepskin. Chamois is well regarded for its supreme softness, absorbency and light tan color. It is pronounced SHAM-wa, or parochially, SHAM-ee. Calfskin: Leather from young cows. It’s smoother leather, but it can be roughened to create “velour leather,” or embossed with patterns and other textures. It is considered dressy and is usually found in darker shades (blacks and browns). Cowhide: Leather from full-grown cows that is used for shoes, boots and jackets. Tough and durable, it can have a smooth or rough finish. You’ll find it in all colors, but mostly shades of brown and black. Ostrich:”exotic” leather found on belts or shoes. Ostrich resembles a plucked chicken, and as such, has a “goose bump” appearance. Price: A good leather blazer can cost you anything between $250 to $1000. Depending on the quality of the leather, the design and the cut. 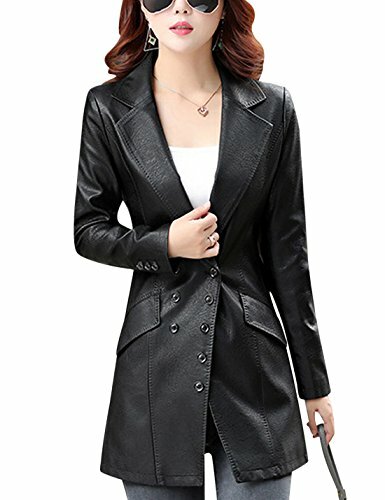 Sizes: Leather blazers come in different sizes be it long or short. Men usually wear long ones. Whereas women prefer both long and short. – Store your leather jacket either flat or on a wide, sturdy, padded hanger to prevent stretch marks. Make sure to never use a plastic cover. Take care of the stains pronto. When in doubt take the jacket to the dry cleaner.